Ray Allen is the smoothest shooter in NBA history. That wasn't his only asset back in the 2000s though. 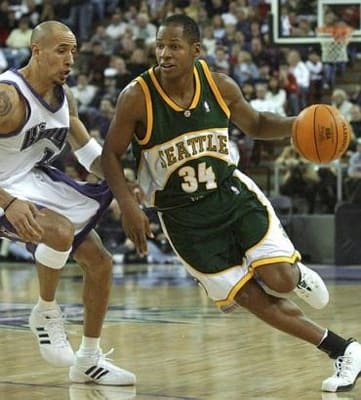 When he was still Jesus Shuttlesworth, Allen was an all-around player that could drive, shoot and dish. He was cursed by playing on OK teams in Milwaukee and Seattle that made the playoffs, but weren't considered to be legitimate contenders. So, as soon as he hooked up with Paul Pierce and Kevin Garnett in Boston, it was no surprise they won the title that year. When he goes up for three, uncontested or not, the entire universe knows there's a damn good chance he's making it. Dude's stroke game is up there with the best of 'em. Ayo!